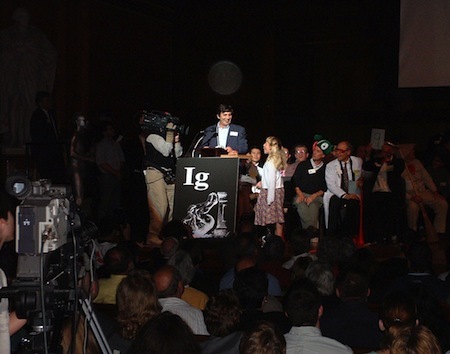 This photo shows Andre Geim at the 2000 Ig Nobel Prize ceremony in Sanders Theatre, Harvard University. Geim and his Ig Nobel co-winner, Sir Michael Berry (who had a prior commitment and so could not attend that ceremony) were honored for using magnets to levitate a frog. Here eight-year-old Miss Sweetie Poo tells him “Please stop. I’m bored. Please stop. I’m bored…” Nobel Laureates Rich Roberts (green hat), Dudley Herschbach (white coat) and Charles Clements (black hat with gold band) are visible in the photo. The man sitting next to them (at right, holding a broom to sweep paper airplanes) is Harvard physics professor Roy Glauber. Five years later, in 2005, Glauber was awarded a Nobel Prize in physics. Five years after that, in 2010, Andre Geim also won a Nobel Prize in physics. Photo: Herbert Blankesteijn / Annals of Improbable Research. NOTE: Technically, Andre Geim is not the very first person to have been awarded both an Ig Nobel Prize and a Nobel Prize — but he is the first to win both as an individual. Bart Knols, who (together with Ruurd de Jong) was awarded the 2006 Ig Nobel Prize in Entomology (for showing that the female malaria mosquito Anopheles gambiae is attracted equally to the smell of limberger cheese and to the smell of human feet) was also one of the hundreds of employees of the International Atomic Energy Agency who together were awarded a Nobel Prize in peace in 2005. That was the same year Roy Glauber was awarded a Nobel prize in physics. BONUS: The Nobel organization interview of Andre Geim on the day they announced the happy news to him. Posted by Marc Abrahams on Tuesday, October 5th, 2010 at 9:40 am under Ig Nobel.